Italian guitarist Nicolò Spera is a versatile chamber musician, in 2012 Spera co-founded the ensemble Duo Chagall with violinist Jenny Diaz. Previously, he worked on an unusual chamber music project with clarinetist Andrew Dykema, and together they performed the complete guitar and clarinet repertoire by the late Romantic Viennese composer Ferdinand Rebay. As a soloist, Spera is one of the few guitarists in the world to perform on both six-string and ten-string guitars, including in his repertoire the extraordinary music of the Franco-Andalusian composer Maurice Ohana. He has given lectures on the music of Ohana at different institutions and festivals, including the Mediterranean Guitar Festival, Arizona State University, and the Conservatorio della Svizzera Italiana. Thanks to his passion for contemporary music, he has had the privilege of collaborations with composers such as John Drumheller, Ryan Fiegl, and the accomplished Italian conductor Simone Fontanelli, giving premières and performances of their guitar works. He has won top prizes at several Italian and international competitions and is regularly invited to play in music festivals such as the Strings Music Festival in Steamboat Springs, the Mediterranean Guitar Festival in Italy, and the Sauble Beach Festival in Canada. He performs as a soloist with different orchestras, collaborating with conductors Andrés Cárdenes, Alejandro Gómez Guillén, Cynthia Katsarelis, and Leonardo Vordoni. In 2011, Spera was appointed to the faculty at the University of Colorado Boulder, where he is Instructor of Classical Guitar. He is also on the faculty of the International Studies Institute at Palazzo Rucellai in Florence, Italy. 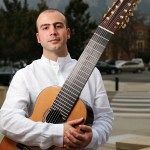 In 2013, he founded the University of Colorado International Guitar Festival and Competition, an unprecedented event that attracts prestigious guests, guitar performers, and students from all over the world. Mauricio Ohana’s music hasn’t generated a strong following among guitarists, perhaps in part because he wrote several of his works for a ten-string guitar. But beyond that, much of it sounds angry. It’s challenging stuff--though he was never convinced that the music of the Austro-German Expressionists was appropriate for him, he was clearly influenced by them. It sounds something like Schoenberg had he been born in Andalucia. Other influences include plainchant, 12th Century troubadour songs, and cante jondo flamenco. He only wrote four works for guitar, but two of those are substantial sets. The most interesting is Si le Jour Parait.... It’s a seven-movement work in arch form--I and VII are paired, as are II and VI and III and V, with IV the emotional heart. Each has a programmatic title, and IV is ‘20 Abril--Planth’. That was the date in 1962 that Franco ordered the execution of Julian Grimau, the leader of Spain’s Communist Party. The action drew worldwide protests, including 800,000 telegrams to Madrid to commute his sentence. The music alternates between ominous quiet and something of a primal scream--indeed, that alternation of calm and frenzy can be heard in all of Ohana’s guitar music. Estelas was written for--and in collaboration with--Uruguayan guitarist Abel Carlevaro. 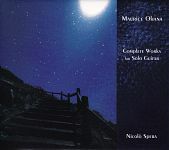 Though the guitarist often included the piece in his programs, it was never published, and this is its first recording. It has Ohana’s trademarks: dissonant rasgueados, bent notes, bursts of fury. Cadran Lunaire is his last work, for ten-string guitar, and it incorporates some of the material from the unpublished Estelas. The title means Moon Dial, and each of the movements evokes pagan images of divination and celebration. Nicolo Spera is an excellent advocate for this harsh landscape of sound. He finds mystical beauty along with the anger and terror of Ohana’s music and is fully up to its demands, whether on six strings or ten. Graham Anthony Divine on Naxos (M/A 2010) is also quite fine, but he doesn’t include Estelas.